The Blackhawk HawkHook Rescue Tool is a versatile rescue and utility essential. Its sturdy blade includes a recessed cutting edge that slices easily through webbing, paracord and seatbelts, so you can quickly and safely extricate yourself from a wrecked vehicle. 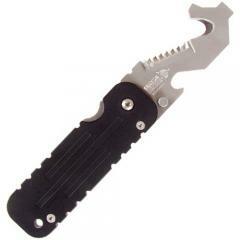 It folds away into the handle for compact carry, and locks open using a reliable frame lock. The blade also incldues a serrated cutting edge for slicing, a bottle opener, a wire stripper and a flat head screwdriver that doubles as a pry tip. The handle comes with textured plastic scales for a secure grip, and features a glass breaker head that shatters windows easily.